Gambler "Ferrari" held a gambling party at his place every weekend to trick people for money. Police Chan is assigned as an undercover to investigate the case. However, he is tricked back by Ferrari and is being terminated to investiage the case. In order to take his revenge, he collaborates with Wong Si Fu, the King of Gamblers, to defeat Ferrari. 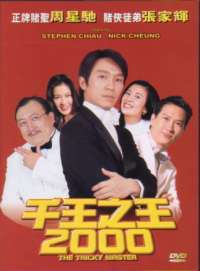 The Tricky Master is a comedy which pairs off two of my more favourite Hong Kong comedy actors. Those two people being Stephen Chow and Nick Cheung. 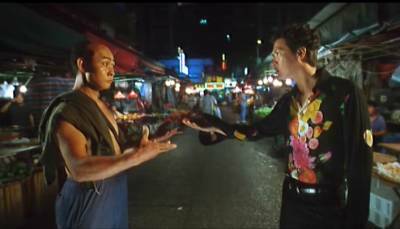 While Stephen Chow is undoubtedly the bigger star of the two, in this film he definitely shares centre stage with Nick Cheung, but this film is also a showcase that more screen time does not a better performance make. The plot for The Tricky Master is loose and thin at best. 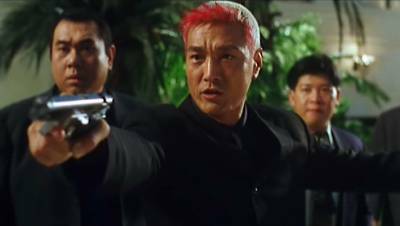 Chan (Nick Cheung) is a cop who thinks he has a thing for being an undercover agent. 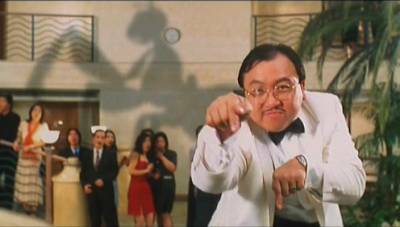 On foiling a kidnap attempt he is assigned a bigger case which aims to bring down a gambler named Ferrari (Wong Jing). His is placed undercover and manages to become a worker for Ferrari, but in doing so he first encounters a woman who he immediately falls for, and she is aptly named First Love (Kelly Lin). On one of his first nights on the job, he has the night security duty in Ferrari's place, but someone breaks in and attempts to download all Ferrari's files which will apparently prove his guilt in various crimes. The intruder is none other than First Love. With her in the process of being caught, Chan decides that he has to help her out, so manages to make it look like he is trying to catch her, but in doing so lets her escape, with himself as a hostage. "Hi, I'm looking for a condom... have you seen one?" After a bit of chit-chat, they come up with a plan to retrieve the data from Ferrari's computers. Chan brings First Love back to Ferrari's house, claiming to have captured her, and while they are awat dealing with her, he slips into the computer room and downloads the data. After been called, the police arrive with the intent of arresting Ferrari. However, a very VIP is staying over there, and was assaulted by Chan, so they leave with only the data that was downloaded on cd. Things get worse when it becomes clear that Chan was tricked by Ferrari, who is reknowned as being an ultimate gambler, trickster, swindler and all that sort of thing, and the data on the cd is infact a computer virus which wipes out the police database. As a result Chan is fired. Desperately wanting to get his own back on Ferrari, but realising that he can't do it himself, he turns to his girlfriend who's brother-in-law is also reknowned as being an ultimate swindler etc. for help. "That's a nasty gash on your head there... no wait it's your hair." I was going to recount more of the plot, in fact, I was going to tell most of it as knowing the story beforehand would make no real difference to your viewing of the film. But I decided not too, as that will just be story-telling then, not reviewing (believe that or that I got bored telling the story - your call! ).The Tricky Master rides almost soley on its comedic value, and with that there are big hits, but also big misses. I don't know whether I'll be alone in thinking this, but I found the first fifteen to twenty minutes of the film to be embaressingly bad. The odd bit raised a slight smile on my face, but the rest of it just wasn't funny, not at all. It wasn't the style of humour that made it like this either. Some of it was the ridiculously stupid humour, other bits kind of surreal(ish), some spoof and some outright slapstick type stuff also thrown in, but pretty much none of it worked. The foaming at the mouth gag wasn't really funny first time round, but using it again within about 2 minutes is horrendous overkill, trying to milk the humour content dry, despite there having been a long drought where that gag is concerned. I could easily tell that a particular thing was meant to be funny, but I don't know whether it was Nick Cheung in these opening stages, but it just didn't come across funnily. "You stick your right foot it..."
There is also the complete lack of logic in the "shooting in the gas filled room" scene. He puts a carton of some juice drink in front of his gun so that there are no sparks when he fires, and he can therefore shoot the bad guys. The people who thought up that one obviously also forgot there would be a spark at the other end of the gun where the gun's hammer hits the back of the bullet to ignite the gunpowder... But yeah, I know, who needs to be accurate in a ridiculous comedy?! After really cringing and feeling embaressed that I was watching such a sh!te film, things started to pick up once Stephen Chow's character started to appear more often. The banquet scene where he is with his two bodyguards who are doing all his hand gestures for him, is really quite funny, and it is this point you start to realise who got the better script out of the two leads! 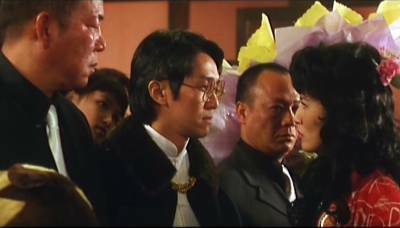 Nick Cheung can do comedy, very well too, but the script writer clearly did not want him to upstage Stephen Chow, or even come remotely close! "Should Nick Cheung have been cast as Hero? Answers on a postcard..."
From this point on the film becomes a very entertaining flick. There are very frequent laughs, which will make you wonder why they let the opening twenty minutes pass, as they could clearly have done much better. I cannot list all the good laughs, but I will list the ones which I thought were hysterical. Admittedly, the ones I found the funniest were spoof scenes/actions from other films, so if you have not seen or are not familiar with the original work, then the humour may be lost on you. Anyway, the two which stand out a mile are the Ring and Bruce Lee spoofs. I genuinely believe that anyone familiar with those two will find those scenes to be a great laugh. "The tash distracts her from my chubby cheeks!" 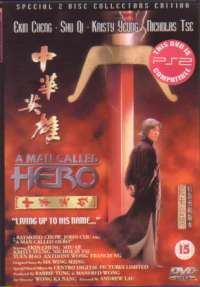 The Tricky Master spoofs quite a few films and other things, two of which I've just mentioned, there is also A Man Called Hero or more specifically the character Hero, but there is one which I just can't put my finger on. The scenes where Nick Cheung is out to try and get a condom, and you see him slowly raising a hand and getting a slow double hand raise in reply, as the camera pans slightly round them, I'm sure I've seen something like that before. Annoyingly, I don't have a clue where or when. I'm guessing it was spoofing a famous TV advert or something like that, I don't know, but something about it was quite familiar to me. Maybe I'm just remembering it from the first time I watched this film... who knows?! "Careful where you point those! You can blind me with them you know!" 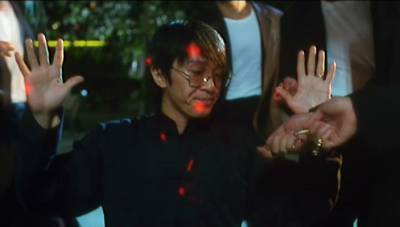 Anyway, there are a good number of laughs in the last hour of The Tricky Master, pretty much all of which involve Stephen Chow in one way or another, although the rest of the cast do get their own comic moments every now and then. But comedy isn't all that there is to this film! As a fan of Hong Kong cinema, it is no surprise that I like a good fight in a film, and in The Tricky Master we're given one to keep us satisfied. Now this is not a martial arts film, so it isn't a long drawn out, technically very complex effort, but it is still nice to watch nonetheless. It is Chow versus some guy who's name escapes me, and in this fight you can see that Chow is also quite capable of pulling of a few good moves. The action doesn't appear to have been undercranked at all, but Chow is still fast, flexible and funny! Hey, the three F's! This I gather is because Stephen Chow is also wushu stylist. How good he is at it, I don't know. 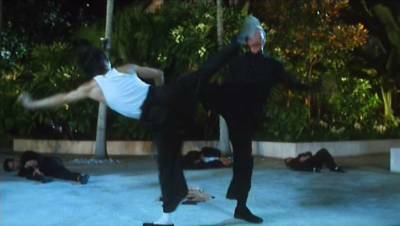 Anyway, his opponent also appears to be a trained martial artist, so their brief encounter is good to watch, made better by the Bruce Lee spoof! "I recognise you from somewhere..."
Acting wise, pretty much everyone is over the top. This film, I think, requires that sort of performance. At no point does it take itself even remotely seriously, so if any of the actors or actresses gave a very serious performance, they would seem very far out of place! Nick Cheung's effort here got better after the dire opening, and Chow is as funny as ever. Kelly Lin, despite her good looks, was nothing special in her role, but Shooky Kwan and Sandra Ng were both very good in theirs. The rest of the cast were all on par. So to conlude this section, I do recommend The Tricky Master, as there are some classic moments in this film, and once it gets going, it stays going. If you hate the first twenty minutes like I did, just stick it through as the good stuff is further on. But if you like the first twenty minutes, then I think you are in for a fantastic time, as it only gets better! I'm just glad the crap section was at the start of the film, as the way it stands you leave the film with a smile, remembering the latters parts. If it had finished with the crap section and started with all the good stuff, then I think far more people would really dislike The Tricky Master. "*Bruce Lee style* Hwaaaaa.... Ooooooo"
The audio track I listened to was the Cantonese mono. There isn't really much you can say about a mono soundtrack. As far as I am concerned it served its purpose. 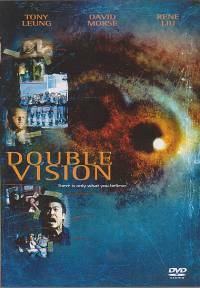 This film didn't really have any instances where it would have been improved had there been surround effects being used. All speech was perfectly intelligible, and the volume balance between the effects and the speech was good, with nothing drowning out anything else. The subtitles were removable, and in them the English was ok. There were quite a few instances of bad spelling, bad grammar or just the wrong word being used. In some cases the wrong word actually sounded like the correct word (forgotten the technical term for that), like for example (this isn't an example from the film), 'toad' and 'towed'. Both sound the same, but only one would be right in a particular sentence's context. Anyway, aside from that, they were bold white with a black border around each letter, and were positioned on the film print. "Shadow boxing with a difference!" The film is presented in a letterboxed print. On the whole I thought the print looked pretty good. I don't recall seeing much in the way of blemishes or speckles, nor do I recall seeing much in the way of grain or the like. So in that respect I was pleased. Detail levels didn't seem that great, as a lot of the finer details to the scene were not really resolved. However, colour reproductin was pretty decent throughout. In the extras department there is much more than you would usually expect from a Universe DVD. You've got Star Files of Stephen Chow and Sandra Ng in both Chinese and English, the film's trailer, and then this is where it gets really surprising... You've got interviews with the cast! In total five cast members are interviewed, those being Stephen Chow, Nick Cheung, Wong Jing, Kelly Lin and Shooky Kwan. The interviews are in Cantonese, except I think Kelly Lin speaks in Mandarin, and they are subtitled... in traditional or simplified Chinese. Not english. So really this extra is no good to you unless you can read Chinese or speak Cantonese and/or Mandarin. The next extra is one titled "Gala Premiere". This is basically scenes from the film's premiere in Hong Kong (presumably), and is the same place as where the interviews were conducted. This piece also has short snippet comments from the cast. Again in Chinese with no english subtitles. Lastly there is a 'more attractions' section which has a trailer for A Man Called Hero. So there are far more in the way of extras than you would expect, but most of them, and probably the decent ones too, are only useful for Chinese speakers or readers. "And one... sorry, two for the guys..."
The Tricky Master is a film which really does start of cringe-worthily bad. I was in disbelief watching at how cheesy and bad the film began. 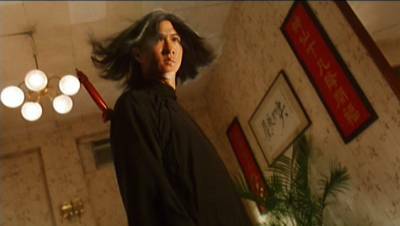 Fortunately once Stephen Chow's character becomes more involved in the story, the film improves dramatically. There are some hysterical spoof scenes which had me laughing out loud, and they will be what I remember this film for. The Tricky Master at no point takes itself seriously, or anything even close to that, which is also a good thing. It helps you forgive the dreadful opening twenty minutes or so. However, once it gets going and starts being genuinely funny, it pretty much stays that way, and by the end you finish watching in a good frame of mind having been well entertained, for the last hour anyway.